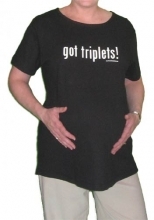 Got Triplets Maternity T-Shirt Discounts Apply ! You moms expecting triplets have our utmost respect and admiration. We've created Got Triplets! especially for you. A classic look and our soft maternity t-shirt to keep you comfortable. Available in white or black.